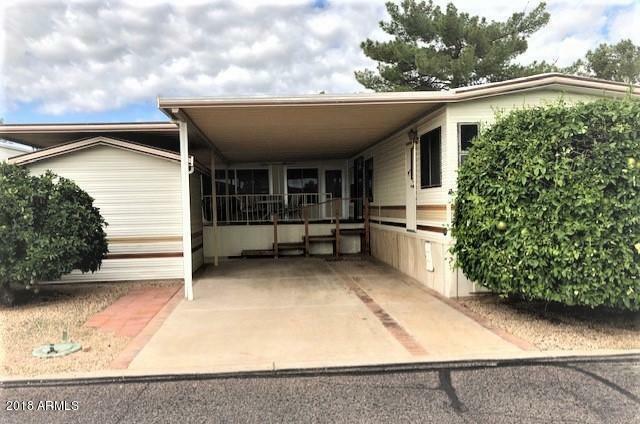 A VERY NICE PARK MODEL w/AZ ROOM GIVING YOU PLENTY OF SPACE AND STORAGE. 1bdr & 1 bath. THE AZ ROOM CAN BE USED AS A SECOND BEDROOM WITH ITS OWN PRIVATE ENTRANCE. ALL THE APPLIANCES ARE NEWER AS IS THE HEAT PUMP. THERE IS A VERY NICE, LARGE DECK WITH A COVERED AWNING, EASY TO ENJOY YEAR AROUND. A STACK WASHER/DRYER AND A UTILITY SINK ARE IN THE SHED. ALL THE FURNITURE WILL STAY. THE PERFECT HOME FOR YOU TO USE OR RENT. VERY NICELY LOCATED NEAR ONE OF THE NEIGHBORHOOD CENTERS WHERE YOU WILL FIND A POOL, HOT TUB AND RECREATION ROOM. ALSO CLOSE TO HAPPY TRAILS TOWN CENTER WHERE YOU CAN ENJOY, SWIMMING, TENNIS, PICKELBALL, WORKOUT ROOM, ARTS & CRAFTS, LIBRARY, AND MUCH MORE. JOIN ONE OF THE CLUB. STAY AND PLAY. BY THE WAY, THIS OWNER WILL CONSIDER CARRYING PART OF THE LOAN. Cross Street Bell Road & Happy Trails Blvd.